Flo The Action wrote: Is anyone suggesting we go after Barrie? Irony see the logic in that. Being a righty and all. Yes. Him and Duchene please. Ok ok. After Lala land is gone since he will cost between 6-7 mill and duschene and his 6 mill we have to trade Ceci, Zib, our first and likely another big piece to get that maybe two! Then we are between a hard and a rock place on the cap. Yeah I dunno spezz... This ain't Philadelphia. wprager wrote: Who is Lala land? suggesting we move on from a state of lalaland where we can just add anyne via trade with no budgetary or cap constraint. Oh, I thought you were referring to a specific player. With the lack of NHL hockey tonight we could sure use some "Off Season Rumours." It's part of a master plan that has Ceci and Lazar heading out and Stamkos and Barrie in. Zib and Ceci for Barrie and Duchene. I'm for it. Not a fan of trading ceci. SpezDispensed wrote: Zib, Ceci and...? Trade for Duchene and Barrie, sign Stamkos and Lucic, plan the parade. tim1_2 wrote: Trade for Duchene and Barrie, sign Stamkos and Lucic, plan the parade. 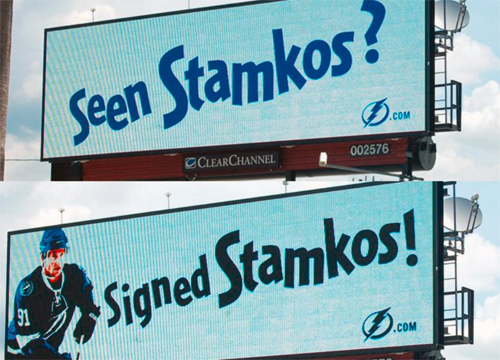 Melnyk already bought the Stamkos billboards at Oren Koules' yard sale.